Beauty extracts in glass ampoules! 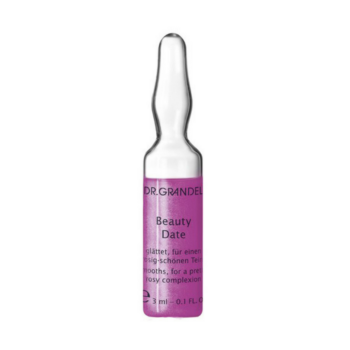 For over 65 years, DR GRANDEL has been very successful in developing and manufacturing active concentrate ampoules for the professional beauty market. This background has provided us with considerable expertise in this category of skin care products. In professional skin care, beauty extracts in glass ampoules have become virtually indispensable. The advantage of this type of packaging are obvious: it allows concentrated nutrients to be delivered to the skin and, at the same time, to keep the concentration of preservatives at a minimum. In addition, the ampoules are safe to us. 1. Gently knock against the ampoule allowing the liquid to flow down. 3. To protect your fingers, wrap a tissue around the ampoule or alternatively, use an ampoule breaker tool. DO NOT OPEN THE AMPOULE WITH BARE HANDS! • Gently knock against the open ampoule to begin the flow of the active concentrate. • Pour the contents of the ampoule by portions into the palm of your hand. • DO NOT PAT THE OPEN AMPOULE DIRECTLY ONTO THE SKIN PARTS TO BE TREATED but use your fingertips to apply the liquid to the carefully cleansed skin of face, neck and décolleté and gently pat it into the skin for several minutes. • Follow with a DR.GRANDEL skin cream of your choice. • For external use only (do not swallow or ingest). • Keep ampoules out of reach of children. 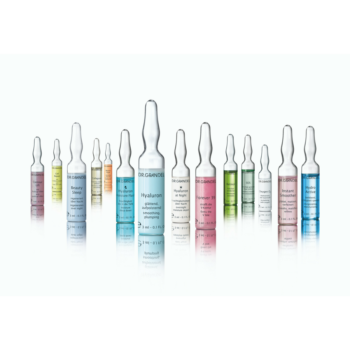 • Aqueous ampoule contents may also be applied to the skin around the eyes. But avoid contact with the eyelashes. • Do not apply oil-based ampoule contents to the skin around the eyes.